But from October 1st, single parent holidaymakers travelling with Virgin could save hundreds of pounds on trips to the Caribbean resorts. There are almost two million single parent families in Britain with figures show this number has increased by 15 per cent in the past 20 twenty years. Fifty-six per cent have even invited a friend or relative on holiday with them to get their money’s worth. 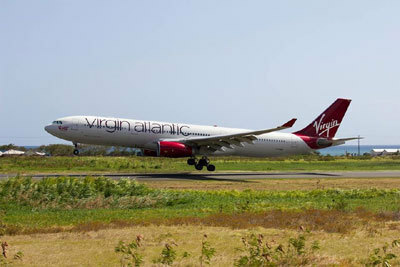 Virgin’s partnership with Elite Island Resorts Caribbean means single parents will avoid hefty room fees in ten Caribbean resorts, including hotels in Antigua, St Lucia and Barbados. Rosie Ferguson, CEO of Gingerbread, said: “Families come in all shapes and sizes, and single parent families make up one in four families with children in the UK. “But we constantly hear from single parents who find themselves ‘priced out’ of family activities. “All too often we see tickets, deals and memberships that offer family discounts – but only for couple families. “That isn’t just frustrating for single parents; it’s also short-sighted of businesses, which are ignoring two million potential customers. But seven per cent say they find it harder to travel as a single parent family, with more than three quarters saying the cost can prove too much to fund alone. And almost eight in ten have had to make sacrifices to be able to afford a holiday with their children, including cutting back on luxuries for themselves, selling personal items and taking on a second job or overtime. Joe Thompson, from Virgin Holidays, said: “At Virgin Holidays we believe that everyone can take on the world, and are proud to do our bit in helping single parents give their families the opportunity to explore some of the most exciting destinations across the globe. Paula Whitehead of Elite Island Resorts added: “We are a firm family favourite with UK travellers, as our all-inclusive stays offer free of charge activities for children of all ages - including watersports and a kid’s club activity schedule. “Our families also love our free of charge ‘Caribbean Firsts’ like Caribbean FloatFIT, Silent Cinema, Colour Me Calm Club, Sleep School and Caribbean Choir workshops; so it was important to us to launch the first single-parent offering in the Caribbean. 3. Think local: Don’t be afraid of local transportation such as coach systems, and local customs such as ‘happy-hour’, to make the pound stretch further.